Sunglasses. Shocking as it may sound I didn’t feel the need for them a single time on the stretch of the whole Camino. The sun is always either on your back or right on top of you. It never shines directly into your eyes. Sleeping bag. Most of albuerges have blankets for those few chilly nights. Sleeping bag liner (like the one I had) is all you need. The same goes for sleeping mats and absolute extreme – tents. Walking sticks. Seriously, the only uses for them I can think of is to annoy other people with the constant tsk tsk tsk sounds or in those frequent situations when you have to kill a baby whale or something. Other than that I fail to comprehend how hitting asphalt with a stick every second or so is contributing to your general walking experience. Umbrella. I’ve seen people carrying those quite often. The thing is that light drizzle is nothing and when the heavy rain comes (been there), trust me, no umbrella is gonna help you. Get a poncho instead. It doesn’t weight anything and will do the job protecting both you and your backpack from any rain. Entourage. You don’t need to bring friends from back home. You’ll make new ones on the fly. The ones that will match your speed, endurance, willingness to sightsee, etc. And the ones that you will leave in a heartbeat and without any regret if they start to be inconvenient company. That’s something you won’t be able to do with your real friends without alienating them and putting a strain on your relationship. Camino is not an exercise where you want to "up your heart rate", you know :) Unless you're experienced nordic walker that knows "techniques" the sticks there are just for what I said - hitting an asphalt and carrying an extra weight. And if you are indeed an expert in the field, my advice will probably won't fly with you anyway. Besides from what I gather about the "sport" is that walking sticks come in two kinds: the ones for the hard surface (asphalt, pavement, sidewalk) and the ones for the soft surface (dirt, clay, etc). On the Camino you will be walking on all imaginable surfaces throughout the day. Will you be carrying all kinds of sticks so you can employ proper "techniques" for each surface type? Probably, no. So why bother at all. 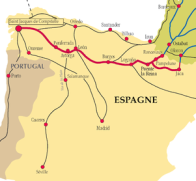 I walked last year from León to Santiago with walking sticks (need only one pair). I do not carry them, I use them. They are really useful when climbing up hills and also when going down with 6-7 kilos on your shoulders. I used seldom asphalt but for those times I have asphalt paws. So no tsik tsik when I walk again this year from Roncesvalles to León. Thank you for interesting blog anyway. I will never run the Camino.